Many of you know that I love hearts! I love the shapes and all of the possibilities. These brooches are from my class Vintage at Heart. This is a great beginner class that explores the use of buttons, trims and lace on this wonderful shape. Every button deserves love! Do you love hearts and embroidery as I do? These lovely little ornaments are perfect for any holiday or gift from the heart! Whether you are an experienced embroiderer or a beginner this class is for you. There are five basic heart shapes with to choose from. All you need to create these lovely ornaments are a few basic embroidery stitches and a little bit of imagination. 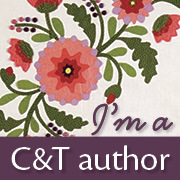 Class Fee: $30.00/the customer must also have a copy of Embroidered and Embellished by Christen Brown. 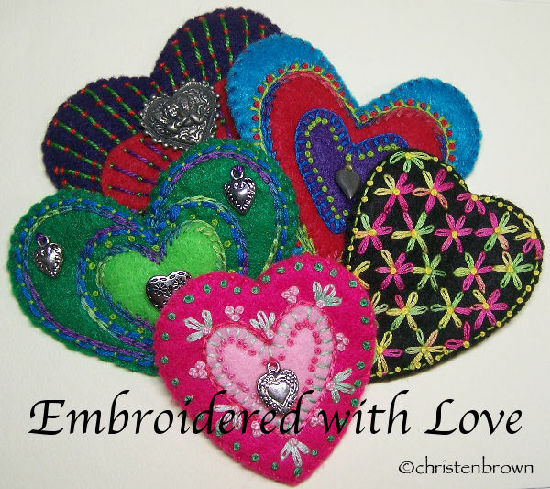 I am excited to announce that I will be teaching my class “Embroidered With Love” for the San Diego Quilt Show, this coming September 12, 2015. You can sign up here. Skill Level Intermediate: machine and hand sewing, embroidery and ribbonwork knowledge needed. Lesson 1: This lesson will cover the machine stitched and collaged bits of lace and silk fabric for the base of the heart, (only cotton, rayon or silk lace will work for the base, you will need to know what you have before you start the project). The finished base and the silk ribbons will be dyed in the second part of this lesson with Colorhue dyes (no other dye will be used or discussed). Lesson 2: This class will focus on the ribbon worked (ribbon cut to a specific length and stitched with a needle and thread) flowers and leaves, that will become the floral vignettes for the heart. The flowers include: the Chou Rose, Double Edge Rosette, and the Silk Bias Berry; the leaves include: the Simple Leaf and the Prairie Point Leaf. 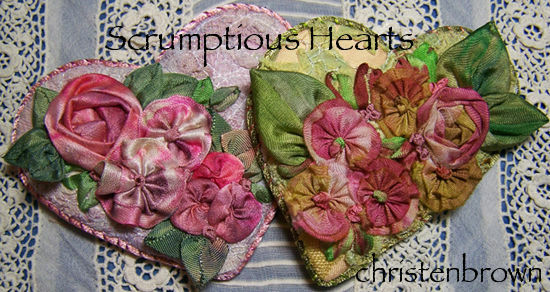 The flowers and leaves are stitched onto the heart shaped base in small vignettes. Lesson 3: This class will focus on the silk ribbon embroidery stitches (ribbon threaded through a needle and stitched through the fabric to form a flower or pattern) that include the Lazy Daisy and French knot; these are stitched around the floral vignettes. Once the base is adorned with the ribbon worked flowers and leaves and embroidery, then the brooch is assembled with the backing and outer trim.